FulaFoam™ ProGun Gun applied foam. FulaFoam™ Pro gun applied foam is a triple expanding, general purpose, polyurethane foam that will seal against noise and moisture, as well as fill holes and penetrations. 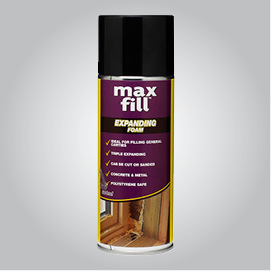 Suitable for use with many commonly used building materials, including polystyrene. Not recommended for: constant water immersion as Fulafoam™ Pro is not water proof, where foot or vehicular traffic is expected, insulation under plastic baths as foam will compress or collapse. Use as a buoyancy device in boats, drums etc. Ensure that the air temperature is above 5°C. Do not have sparks or flames near curing Fulafoam™ Pro. May not adhere to some plastics e.g. polyethylene. All surfaces must be clean, dry, sound and free of dust, oil, old sealant or other contamination and above 5°C. Application: Screw can onto gun coupling until locked – do not over tighten. Use petroleum jelly lubricant around mounting mechanism to aid removal at a later stage. Hold can and gun and shake at least 20 times. Open adjustment screw at rear of applicator gun to allow product to be dispensed. The rate of extrusion can be controlled by the valve setting. Squeeze trigger gently to dispense product onto surface. Fulafoam™ Pro is tack free in ten minutes, cuttable in one hour and fully cured in 12-24 hours. Full strength is not reached until full cure has occurred. Foam will expand after application. If excess foam is present, it may be trimmed with a knife or sanded once cured. If used outdoors, paint with exterior grade acrylic paint. If filling large void (>50mm), apply foam in layers and allow to cure before applying subsequent layer.